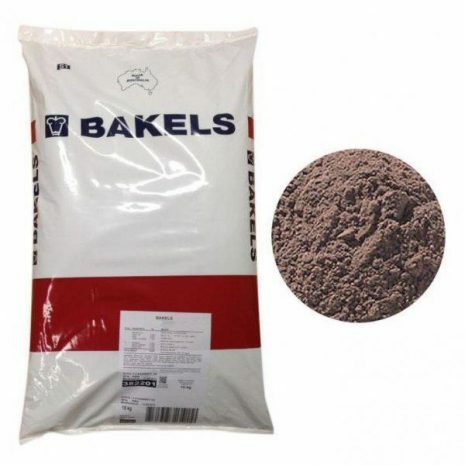 Pettina Chocolate Cake Mix 15kg – A great cake mix for your next birthday cake or just for the fun of it. Pettina Chocolate Cake Mix can be used in many ways to create delicious desserts and cakes. For more great recipe ideas, visit www.bakels.com.au. Sugar, Wheat flour, Vegetable fat (vegetable oil, emulsifiers (471,477), antioxidant (307)), Cocoa powder (7%), Vegetable oil (antioxidant (307)), Milk solids, Maltodextrin, Thickener (1422), Raising agents (500, 541), Potato flour, Whipping agent (emulsifiers (472b, 477), glucose, milk solids), Flavour, Salt, Colours (122, 133, 155), Emulsifier (481). BASED ON A 15KG BAG: Energy kJ 1740, Protein g 4.8, Fat – Total g 12.7, Fat – Saturated g 5.9, Carbohydrate g 70.7, Carbohydrate – Sugars g 40.2, Dietary Fibre g 3, Sodium mg 515. Contains: gluten and milk. May be present due to shared equipment: tree nuts, egg, soy, sulphites and sesame. GMO STATUS – Does not require any GM label statement under Standard 1.5.2 of the ANZFA regulations. All quantities expressed in the nutritional information are average quantities only.